Almost a year and a half ago, NASA ignited a media firestorm after it announced the discovery of a new organism with alien implications. The whole fiasco began when a scientist found a new bacteria in Mono Lake that could grow in the presence of high concentrations of toxic compounds. These types of bacteria are not uncommon on earth. Life seems to find a way to thrive at all extremes and a salty lake in California is no exception to this rule. Researchers have discovered a diversity of life in hot springs, at undersea volcanic vents, and on the cold arctic sea floor. 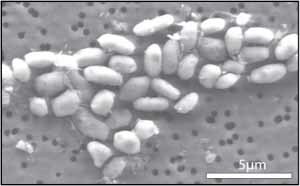 The discovery of this new bacteria; however, was remarkable because the researchers believed that it could use arsenic in the place of phosphate. To the general public, this may sound trivial, but many of the biochemical reactions that provide life require phosphates. The reason why arsenic is so toxic to humans is that it injects itself into all of the processes that use phosphate and prevents those processes from working properly. For example, the molecular backbone that keeps our DNA together is composed of phosphate; the energetic molecules that are produced by the power factories in our cells are composed of phosphate; the specific addition of phosphate to some proteins turns them on or off. Phosphate and its derivatives are essential for life, so to find a bacteria that could function without phosphate and use arsenic in its place was an amazing discovery. With the launch of this year’s “Rock Stars of Science” campaign, there’s been a lot of talk about how to best promote science. I’m no marketing guru, but I am a scientist. This latest campaign is better than last years', only because it’s more diverse, but I think it really misses the boat. Is the public really going to be inspired by a couple of pictures in GQ of scientists looking uncomfortable and over dressed in the presence of Rock Stars? The most appalling aspect of this campaign is that there is no highlight of the researchers or their science. There truly are some science all stars in this group, many of which are well spoken.